Stock markets sold off on Monday after U.S. Treasury Secretary Steven Mnuchin called the heads of six major U.S. banks Sunday in an apparent attempt to reassure jittery financial markets — but ended up only stoking investor fears. 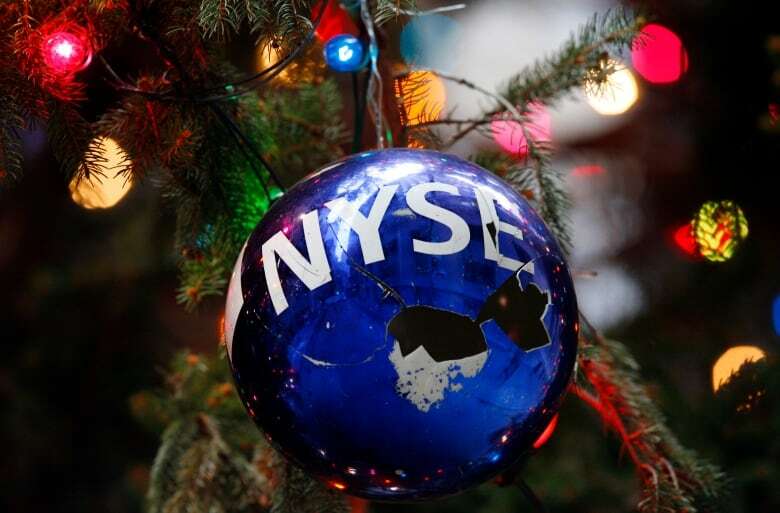 In thin trading on Christmas Eve, the Dow Jones Industrial Average lost 653 points, or almost three per cent, to close below the 22,000 level for the first time in 15 months. That's more than 5,000 points below where it was less than three months ago. The broader S&P 500 was down more than two per cent at 2,351, while the technology-focused Nasdaq was also little over two per cent lower at 6,192. All three have lost 20 per cent since their peaks, which means all three are officially in bear markets. Stock markets closed at 1 p.m. ET Monday to mark Christmas Eve. 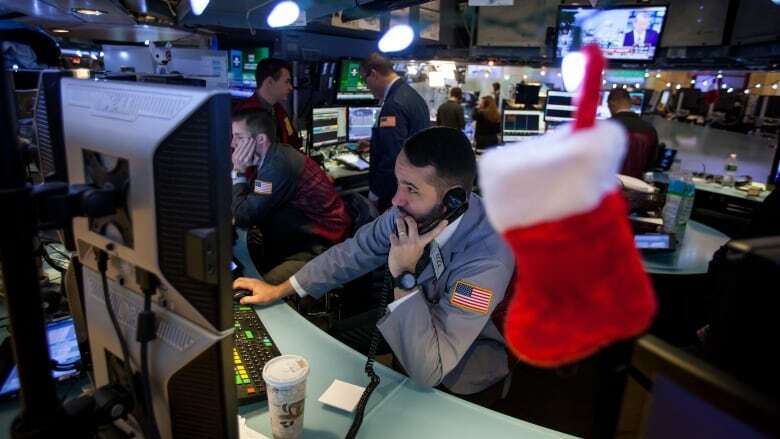 Monday's trading action was the worst on a Christmas Eve for all three U.S. indexes ever. Markets have had their worst month in a decade as investors worry about growth prospects in the midst of an escalating global trade war. The gloom prompted Mnuchin to reach out to the chief executives of major U.S. banks to confirm they have ample money to finance all their normal operations — even though there haven't been any serious liquidity concerns rattling the market. The move was meant to soothe investor fears, but seems to have had the opposite effect. "Reports of Steve Mnuchin meeting with decision-makers will not provide much Christmas cheer," said Chris Beauchamp, chief market analyst at IG. "Mnuchin is most likely worried about his job, but everyone else will draw the conclusion that there is perhaps much more to worry about." "Mnuchin attempted some damage control," Win Thin, global head of currency strategy at Brown Brothers Harriman, said in a note, adding that the move could backfire. "Yes, markets have been worried about recession, [but] until this weekend, however, markets were not that concerned about liquidity or clearance issues. And with markets on edge, the last thing they needed was another issue to worry about," Thin said. The U.S. central bank, the Federal Reserve, hiked its key interest rate this month, and gave every indication that it plans to do so two more times. That also hasn't helped stocks, as higher rates make it more expensive to borrow to invest. Mark Grant, chief global strategist of B. Riley FBR Inc., blamed the Fed, "as they raise rates at exactly the same time that they point out that the economy is shrinking. "In my opinion, they have made a tremendous error in judgment. They are paying no attention, at all, to our declining economic conditions, as they create liquidity issues. Absolute folly, in my estimation." U.S President Donald Trump seemed to agree. He has saidmore than once he would rather see rates stay low to encourage a stronger economy, ignoring the long established principle that the Federal Reserve sets it monetary policy independent of any political interference. The president seemed to blame the Fed for the sell off on Monday, telling followers in a tweet that central bankers "don't have a feel for the market." "He is seeking open warfare on Christmas Eve," said Peter Conti-Brown, a financial historian at the Wharton School of Business at the University of Pennsylvania. "We've never seen anything like this full-blown and full-frontal assault. This is a disaster for the Fed, a disaster for the president and a disaster for the economy." It's not just stocks that have taken a beating recently. Oil fell to $43.96 US a barrel on Monday, off by almost $2. After briefly topping $75 a barrel in October, the U.S. oil benchmark West Texas Intermediate has slumped steadily lower on growth concerns. The gloom in oil has been bad news for the TSX, too, as the TSX slumped to its lowest level in more than two years to close at 13,799 on Monday, off by 135 points or almost one per cent. 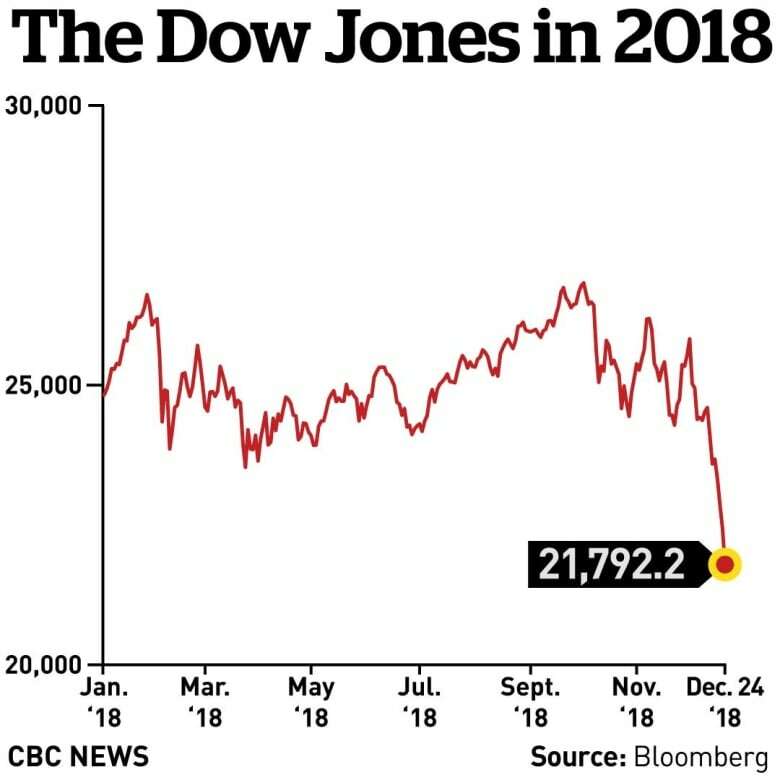 That's the lowest Canada's benchmark stock index has traded since the summer of 2016, having lost about 15 per cent of its value this year. The selloff wasn't limited to North America. France's CAC 40 was down 1.5 per cent at 4,626.39, while the FTSE 100 index of leading British shares fell 0.5 per cent to 6,685.99. Germany's DAX was closed.